Visit Pockerley Old Hall, enjoy the magnificent gardens and take a ride on the Waggonway. The cottage is a recreation of the “lost” home of renowned Georgian quilter Joseph Hedley, who was murdered in 1826, in an appalling crime that shocked the nation. The cottage features stones from Joe’s original home, including flagstones where he stood 200 years ago. The remains of Joe’s cottage in Warden, near Hexham, Northumberland, were uncovered during an archaeological dig by Beamish staff and community members. The exhibit, which tells the story of quilting and the growth of cottage industries in the early 1800s, has been painstakingly recreated by skilled museum staff. A drawing on a postcard that was produced after Joe’s murder gave valuable details about how his home – which was demolished in 1872 – looked. Click here to find out about the story of Joe the Quilter’s cottage. Visit the ‘new house’ – the home of the tenant farmer – and the ‘old house’, which dates back to at least the 1440s. 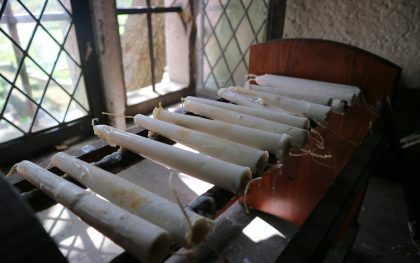 Look out for traditional Georgian cooking and craft activities. 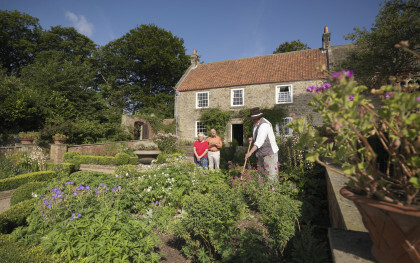 This beautiful terraced garden features Georgian-era plants, herbs and vegetables, which can often be sampled in recipes cooked in the hall. Take a steam train ride at the Waggonway, which tells the story of the birth of the railways, and is home to replica engines the Steam Elephant and Puffing Billy. Due to essential maintenance work, no trains will be operating at Pockerley Waggonway until Saturday, 16th February 2019. Take a walk through the picturesque landscape, as you step back into the Georgian era, with its dry stone walling, riven oak fences, and traditional breeds of animal. The horse-powered whim gin would have been used to raise coal and men out of the mines. Look out for the gibbet looming in the distance. Nestling in the Georgian landscape is this beautiful medieval church, St Helen’s, from Eston, near Middlesbrough. 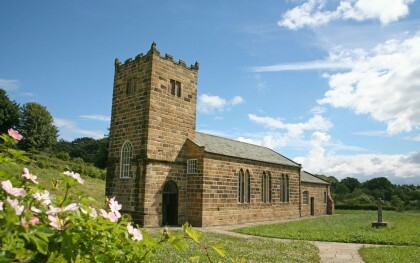 The church was due to be demolished due to vandalism until it was saved and rebuilt at the Museum. 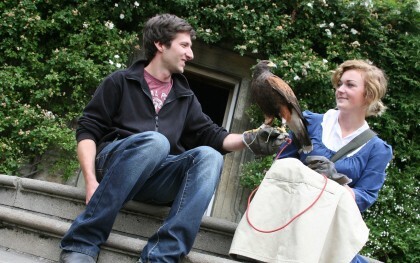 Enjoy the ultimate hands on experience as you take a stroll with a Georgian Falconer and her hawk through the stunning 1800s landscape. In this talk with a member of staff from our Buildings Team, you will find out the story behind Eston Church that is nestled in Beamish’s Georgian Landscape. Leave the bustle of modern life behind and join a member of our gardening team to discover the historical secrets of the gardens here at Beamish. Perfect for the gardener who has everything!